This little necklace was definately hand-made, as I can see the marks of fingerprints where the pieces were molded. 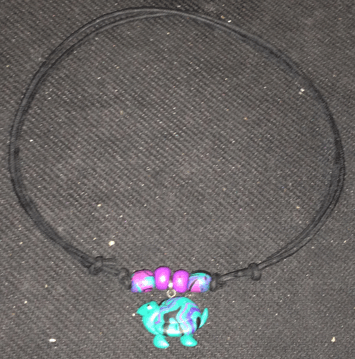 It has four hand-made polymer beads; two are solid purple, the other two are swirled in shades of pink and purple, black and green . The tortoise's shell is also swirled colors, predominantly green, with a solid green head, neck, feet and tail. It has a droopy green eyelid half-closed over a black and white eye. It has a placid, goofy little grin on it's face. The back of the turtle is not decorated and it is made so that it won't flip over when worn. The tortoise has a metal attachment and is attached to the string by a metal loop. The string is stiff and knotted in such a way that the length can be easily adjusted to suit. Very clever, hand designed necklace. It may have been worn once or twice; it's in good condition. There is no maker's mark. The piece is at least 30 years old. The tortoise is about 3/4 of an inch wide - the beaded area is aninch across. The entire necklace weighs 0.2 oz. 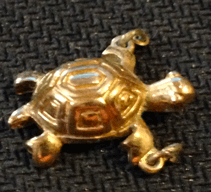 This is a gold colored tortoise that belonged on a piece of costume jewelry. 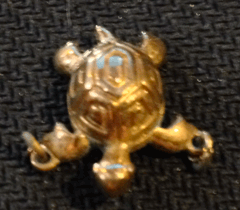 It has hooks on both front feet where it was attached to some sort of chain. 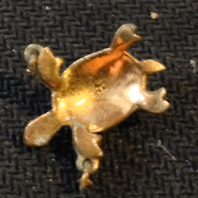 The gold-plated coloration is intact on the surface of the piece, but is fading off in spots on the bottom of it. Still, it's cute. It has a maker's mark - an "H" is stamped into the center of it's belly. It obviously came off of something interesting, and it's definately over 30 years old. It's less than a half inch long and weighs 0.1 oz.